Brought to you by the American Staffing Association, Staffing World is the largest, most comprehensive convention and expo in the staffing, recruiting, and workforce solutions industry. Join us this year in Chicago! 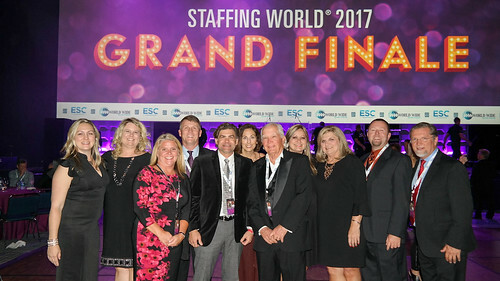 Special thanks to the thousands of staffing and recruiting professionals who made Staffing World 2017 a huge success! ASA continues to update the Staffing World materials page, which is accessible to all who registered for a full convention and expo package. Questions? Contact ASA at 703-253-2020. Save the date for Staffing World 2018, Oct. 16–18 in metro Washington, DC! In this collection of social media activity throughout Staffing World, check out convention photos, ideas, and highlights. Staffing professionals got the technology answers they needed at the Tech Park. An impressive lineup of technology experts gave quick and focused presentations on solutions for the industry. Staffing World 2017 featured a sold-out expo hall—packed with the industry’s leading companies with solutions for staffing companies. Booth reservations for Staffing World 2018 have already begun! Blockchain—Are You Ready for the Future of Staffing Technology?